Last week I walked over to St. Phillips St to meet up with Lisa Shimko at her studio. After a look at her lovely paintings we walked over to Monza Pizzeria on Upper King for a great lunch and a glass of Proseco. I think Monza has the best salads in Charleston and I love the decor. Lisa’s studio is beautiful and inspiring, we met several years ago when she hung some paintings at a show at 53 Cannon. I have followed her work since then as it continues to grow in complexity. 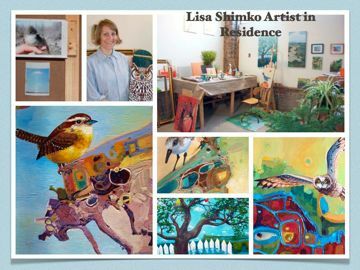 Lisa is a very interesting local artist who’s work everyone interested in local artists should get to know. http://www.ShimkoART.com/ also visit Plum Elements on King to view Lisa’s work in a gallery setting.